Akio Toyoda -- clad in a red-and-black racing suit -- introduced the car himself by flooring the a bright vermillion 86 down the straightaway at the Fuji Speedway. OYAMA, Japan -- Toyota President Akio Toyoda unveiled his company's new 200-horsepower rear-wheel-drive sporty car before thousands of fans at a Formula One race track Sunday in his bid to spice up a brand better known for bland but utilitarian offerings such as the Corolla and Camry. The car, to be called the Toyota 86 in Japan and sold as the Scion FR-S in the United States, has been in the works for five years and received close scrutiny from Toyoda, who is banking on the car as an affordable halo model to burnish the company's performance credentials. Achieve a low price point that can lure recent college graduates. Strive for fun-to-drive handling with a low center of gravity. Strip out fancy electronic control systems and turbochargers. Deliver a ride that can be easily customized and tuned by car buffs. Toyota hasn't disclosed a price or gas-mileage estimates. But the company has said it is targeting a sticker around 2 million yen ($26,000). Tada said the goal is to price the car in a range that would be affordable to recent college graduates. "A lot of cars these days are controlled by computer chips, and that leads to a sense of the car driving you, instead of you driving the car," Tada said after the 86's introduction today at the Toyota-owned Fuji Speedway outside Tokyo near the base of snow-capped Mount Fuji. "We decided to use as few computer controls as possible. We wanted to go back to basics." The 86 was jointly developed with Subaru, which debuts its version -- the BRZ -- at this week's Tokyo Motor Show. Toyota did the styling, while Subaru provided the four-cylinder horizontally opposed boxer engine. Subaru will build both versions at its factory in Gumma, Japan. Toyoda -- clad in a red-and-black racing suit -- introduced the car himself by flooring a bright vermillion 86 down the straightaway at the Fuji Speedway, where some 20,000 car buffs gathered to witness the debut and participate in the annual Toyota Gazoo Racing Festival. The car's name in Japan -- 86 -- is a nod to the popular AE86 line of Corolla-based sports cars that Toyota rolled out in the 1980s. Toyota evoked its sporty roots at the tuner festival with a parade of vintage sports cars that included Toyota fan club members driving their original 86s, 2000 GTs, Sport 800s from the 1960s and a sampling of souped up Supras. The 86 first appeared as a candy-apple red FT-86 concept at the 2009 Tokyo Motor Show. In Japan, the production version drops the "FT," nomenclature for concepts that means "Future Toyota." In Europe, the car will be sold as the Toyota GT 86. The new Toyota 86/Scion FR-S gets a 2.0-liter four cylinder, DOHC boxer engine from Subaru equipped with Toyota's D-4S fuel injection system. Tada admits the car won't satisfy everyone, and he's fine with that. Toyota broke with a long tradition of designing by committee to deliver a car rendered by sports car enthusiasts assembled from within the company, he said. They focused on driving feel, not on numbers. "When you show a sports car to the board of directors, the first thing they ask is how fast it is, what is the lap time, how does its speed compare with rivals. Marketing initially opposed the concept, saying it's not fast enough and didn't have enough new technology," Tada said. "But what is unique about this car is that we didn't target numerical performance goals. We ignored the traditional Toyota development pattern," Tada said. "And the only reason we could do that is because there is a man on the board of directors named Akio Toyoda." 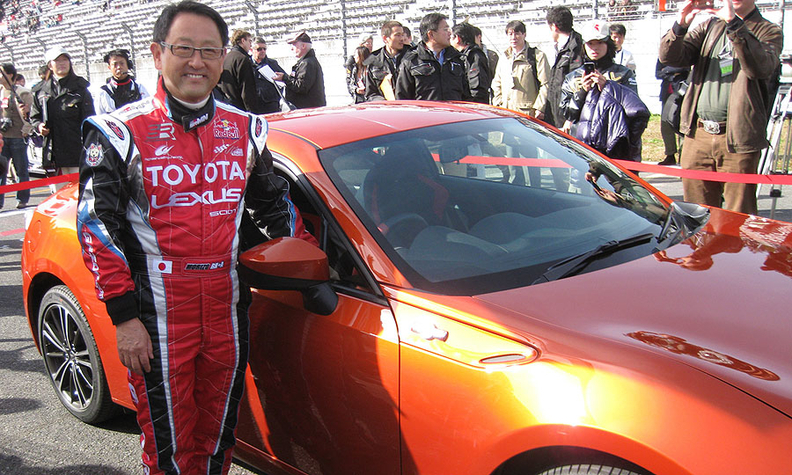 Toyoda, a racing fanatic, was especially hands on in flavoring the 86 -- checking in monthly on the car's development. He often test drove the 86 and gave orders on what to fix. The new Toyota 86 gets a 2.0-liter four cylinder, DOHC boxer engine from Subaru equipped with Toyota's D-4S fuel injection system. It comes mated to either a six-speed manual or six-speed automatic transmission, while delivering 200 horsepower and topping out at 7,000 RPM. The car enters production next spring, and goes on sale next year in the United States. During a test drive for journalists on Fuji's short circuit, the 86 demonstrated lively pick-up, good balance and nimble handling -- all with the distinctive growling rumble of Subaru's boxer power plant. More-punishing journalists had a field day screeching and drifting through the turns. Handling is improved by the boxer engine's low center of gravity. The interior styling reflects what Tada calls "neo functionalism." It is a no-frills, utilitarian look focusing on old-school dials and switches -- with the meter cluster built around the tachometer. Some paneling is simply shiny black plastic, while other trim gets a faux carbon fiber texture. The deep bucket seats have sporty red stitching with ample side bolstering. The steering wheel is the smallest in the Toyota lineup with a diameter of 365 millimeters (14 inches). Toyota says this provides optimal steering performance and grip. The 86 seats four with very cramped rear leg room. But the back seats fold down to provide space for luggage or -- as Toyota pitches it -- racing tires and tool kits. Toyota envisions the car as being popular with the tuner crowd and aims to promote that use by making the car easily upgradeable with a plethora of accessories and add-ons.